In honour of the V&A’s upcoming exhibition of wedding dresses from 1775-2014, featuring some of the most famous dresses in history, I decided to pick my favourite celebrity wedding dress looks. This pink dip-dyed Dior gown is my all-time favourite. It portrayed Stefani’s personality perfectly – punk princess. The tux-inspired top and ethereal tulle skirt was a perfect marriage of masculine and feminine looks for the beautiful Portia on her wedding day to Ellen DeGeneres. This stunning gown was a modern take on Grace Kelly’s infamous wedding dress, creating a romantic, royal look for Ivanka. Even though we weren’t huge fans of this strange-under-the-surface marriage, and it didn’t end happily ever after, this dress was perfect on Katie. It was just right for the Italian venue, and Katie’s look was soft and romantic. I’ve chosen both of the Gossip Girl character’s wedding gowns, as they were both so different and both so darn gorgeous! The Vera Wang gown featured for Blair’s wedding to Price Louis was a regal, princessy ballgown, ideal for the long cathedral aisle and the baroque stylings of the Waldorf Astoria. The second gown, for Blair’s last-minute Central Park marriage to her true love, Chuck, an elegant, embellished Elie Saab showed her grown-up style and sparkled in the natural light. 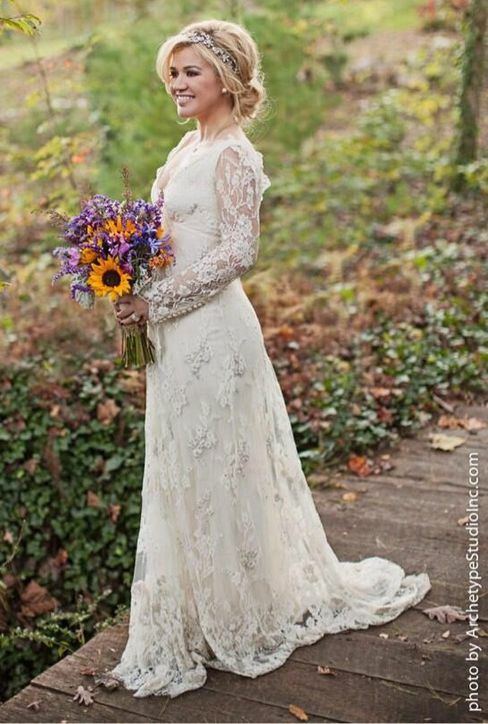 The most recent of my picks, Kelly’s Temperley dress was ideal for her rustic, country-styled wedding. What has been your favourite celebrity wedding look? Comment here!